I will say brown. I would not entirely rule out grey at this point, but am leaning towards not. Here are some photos. 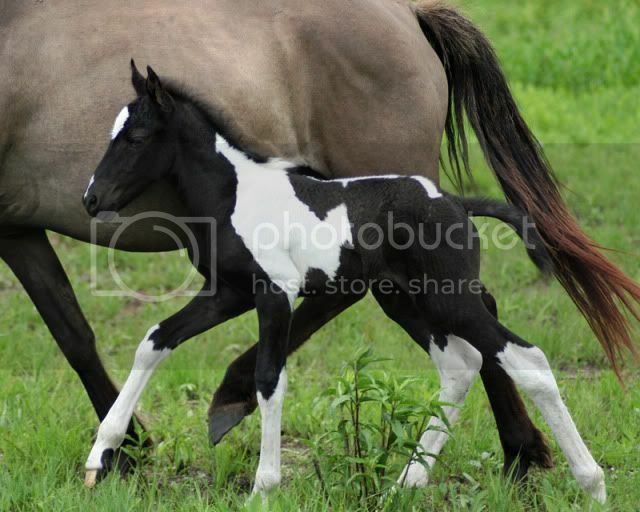 The first is a black foal, the second is a bay. Looks normal black, no grey to me! 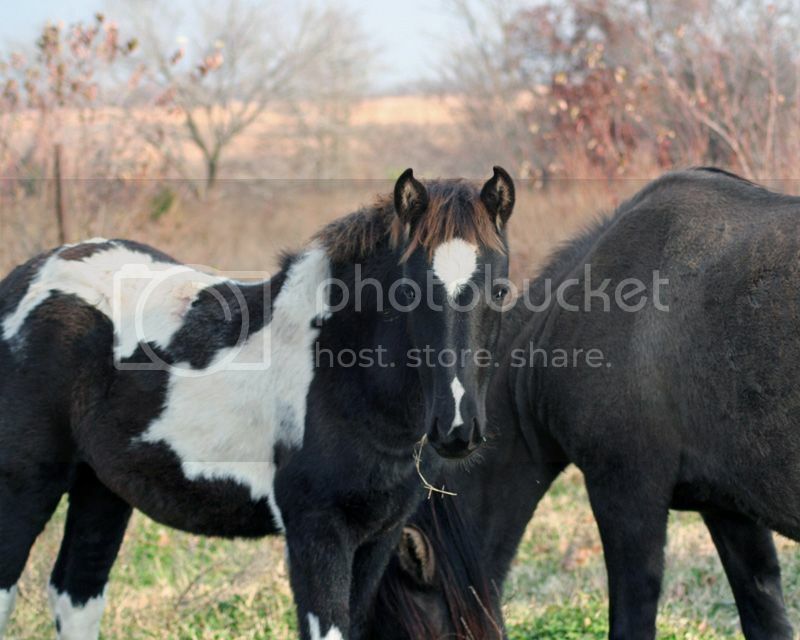 This my filly and colt, she (with the blaze) is black, not sure about the colt. Maybe smokey black. Maybe I'll put some more pictures of him and see what you think. She is actually brown around the nose and eyes but hard to see except a little in the last pic. He's definitely not going grey. I admit there is still an outside chance of Grey, but I would have expected to have Grey goggles by now...is the Grey test readily available now?? I see a hint of brown muzzle. I'd guess brown, no grey. Yes, at the very least Animal Genetics is offering an accurate gray test. 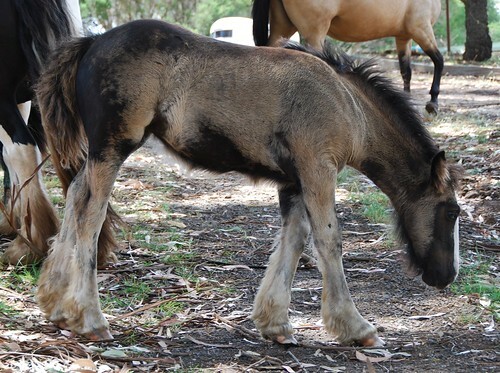 I've had a lot of the more fading blacks get brown muzzles as foals, dunno they just bleach I guess? His dam is a fading black. This filly didn't change much from birth until Fall other than dead fuzz in her mane. I wouldn't be surprised if her dam was homozygous black. I haven't had her tested yet. 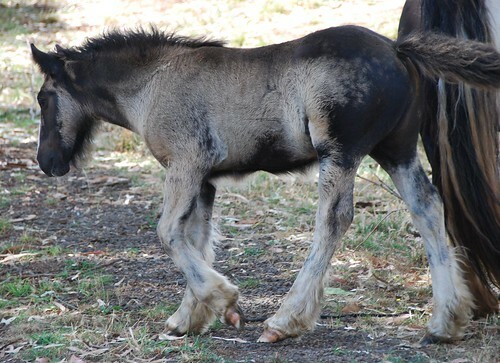 Bred to a bay dun she produced a grulla. 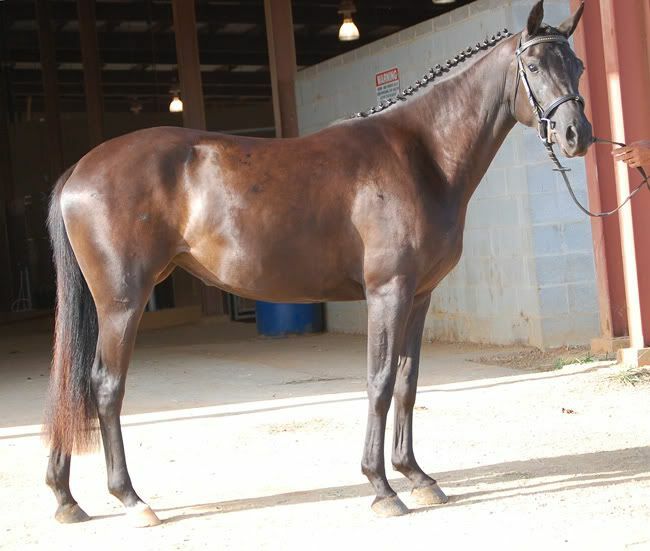 Bred to a grulla (H/Z dun) she produced a grulla. 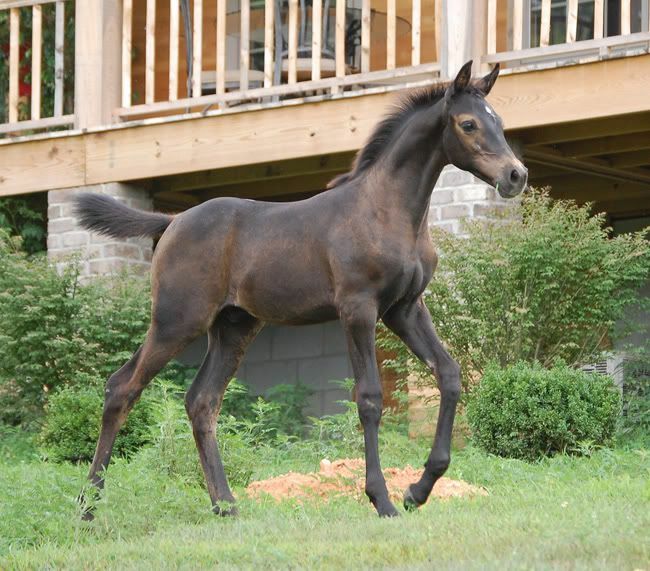 Bred to a chestnut (red dun/chestnut breeding), she produced this black filly. Wow she's gorgeous! Any chance of cream? Dam's dam is black. 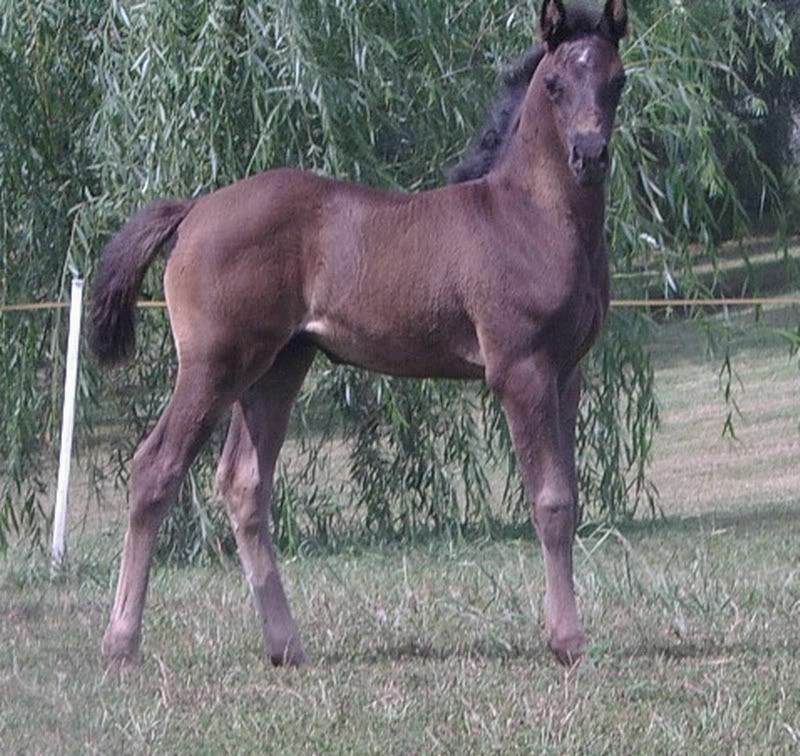 Her parents, black classic x grulla. Their parents were three grullas & a bay one grulla also carried classic. Sire is chestnut tobiano/ LP snowcap. Filly has no chance of cream. That's an awful lot of black bases to rule out cream IMO. I see your point but none have ever produced buckskin or palomino bred to bay or red...in any generation of their pedigrees. Why do you ask? I hope you don't mind if I answer, but she is -phenotypically- a typical smokey black. And with so many blacks in her lineage, I think the point is that it's easily hidden. With only a 50% chance of passing a creme, more than a few breeding would be sufficient to put minds at rest. I have looked at hetero grays and seen them pass the gray gene WAY more than 50%. To the point where, I was thinking some must have turned grey eventually and someone didn't change the registry. I would think at some point a cream would be produced when bred to a horse where it could show...or a smokey cream? What phenotypically gives you that impression? She also carries LP from her sire though minimal. Her golden ears....but that generally should go away as they grow. There is always the exception, and she is a little older than she should be to still have the gold, but she is SO jet black. It is in sharp contrast to her ears. I guess I should have her dam tested. Never thought about it because none of her ancestors in six generations has had a cream based foal, bred to anything non cream. I think I have her sold. I'll mention it to the buyer. 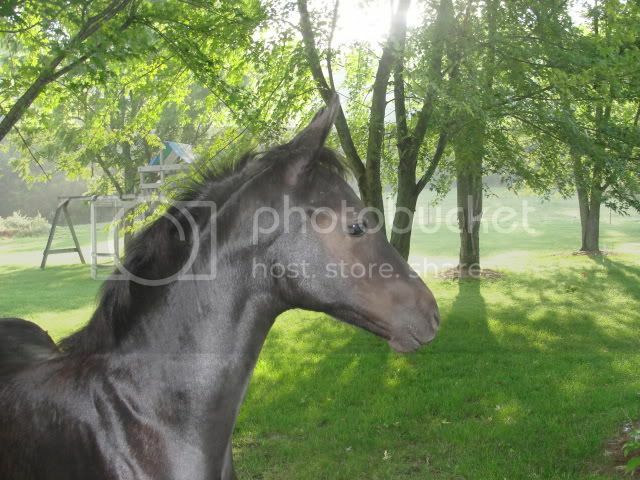 And the blue eyes as a foal and the mane and forelock color in the older photo. What picture are you looking at that has the blue eyes? I think she's straight Black. The photo by the dam definitely has a grayish/bluish tint and I still see it a little bit in the other photo too. When you say blue eyes, are you refering to blue tinges at birth or blue eye color. 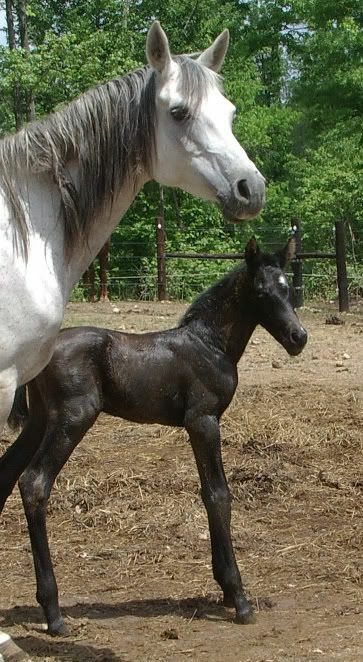 I've had babies with a blue look at birth that turn dark later...like this filly. I've also had them born with green eyes at birth. Had the green checked out. I was told it was associated with LP. At that time it was also said that blue could be LP based. Here is this filly's eye at birth. I've never heard of it being caused by LP. I've seen it occasionally on non-cream, non-LPs, but I find very, very often is a cream indicator. It may not be in this case, but that's awfully blue. I used to think golden or pale hair in the ears was an indicator of smoky black. Don't take any notice of the ears, lol, my words of wisdom for the day. 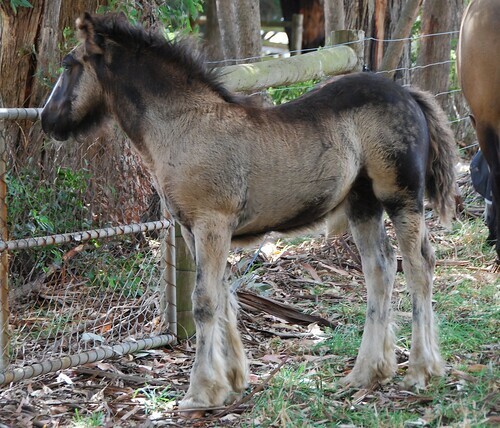 Weanling 4 months, looking very much like smoky black. 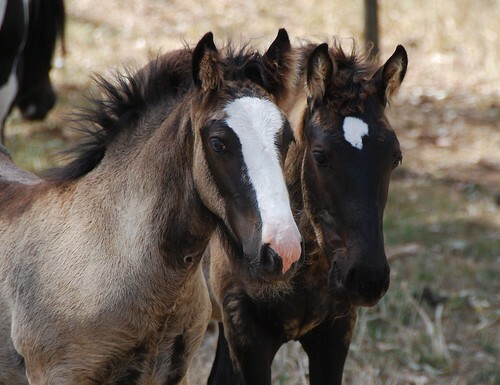 Also, a couple of smoky black foals who look black. I know they are smoky, cos their mummy is cremello, daddy is homozygous black. These two are full sisters, neither have any pale hair in their ears.